The N.C. Chronicles. : The true face of feminism. The white feather campaign. The true face of feminism. The white feather campaign. Ironic isn't it, these cat lovers aka:feminists, owe their freedom to demean men to...men. 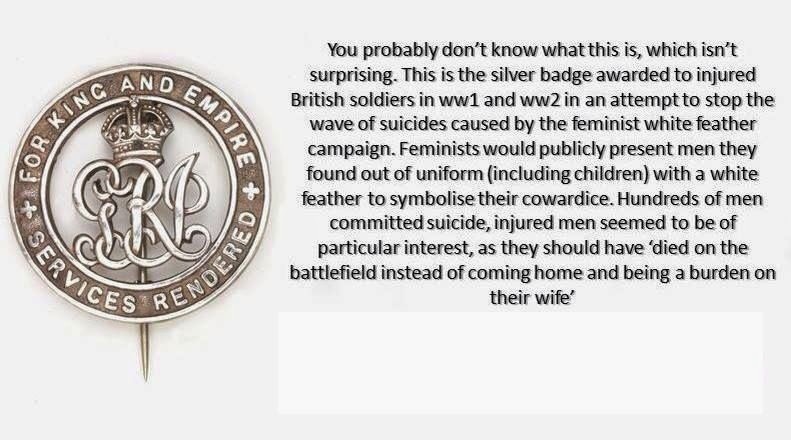 Feminist cowardice began in it's early stages of existence and continues to this day...not surprisingly. From now on, every time a feminist open her yap, a man should stand up and explain how she or he(mangina) holds their freedom to men and to shut the hell up until they too put their lives on the line for the freedom of others. Walk up to them, don't say a word and hand them...A WHITE FEATHER. We should now adopt the white feather and give it to any feminists who demonizes men, in public arenas, when they speak and when they spew out their hatred....as a sign of cowardice. Unless they have been on the front lines and experienced the hardship of fighting for someone else freedom, they have no right to attack half the population.